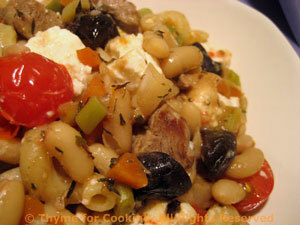 Pasta with Lamb and White Beans, Greek Style, Healthy Weekly Menu Plan. We don't often use lamb with pasta, but, with the leftovers from Easter dinner, this is perfect. Just toss with some pasta, add some green garlic, cherry tomatoes and a 'touch of Greece', and Easter Monday dinner is served. The beans are left from Friday.